Mobile gamers can be happy today, as NVIDIA has officially unveiled a new mobile graphics flagship – the GeForce GTX 680M. As expected the newcomer is built on the award-winning Kepler architecture but at the same time is a bit different from its desktop counterpart. The mobile version of the GTX 680 comes with less CUDA cores (1344 in total) and a significantly lower clock speed that reaches 720 MHz for the core and 3600 MHz for the memory thus enabling 115 GB/sec of memory bandwidth. Also, when compared to the just retired mobile graphics champion – the GeForce GTX 580M the new chip runs only 16 per cent faster while the memory offers just 20 per cent more memory bandwidth. 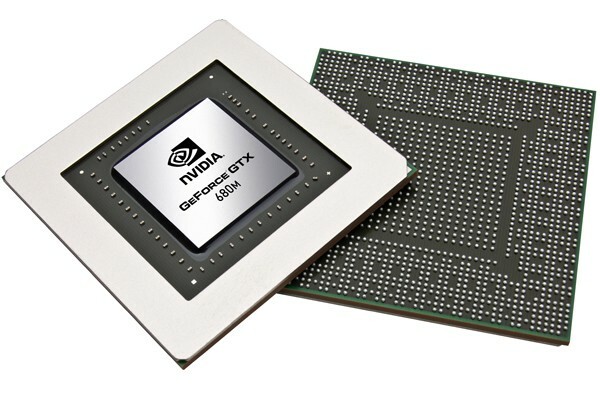 Despite these shortcomings NVIDIA says the GTX 680M will be significantly faster than the GeForce GTX 580M thanks to the significantly improved efficiency of the chip with the performance improvement reaching 80 per cent in certain scenarios. At first the new mobile 3D monster will be available with 2 GB of video RAM only but NVIDIA says the GTX 680M supports up to 4 GB of VRAM so later we should see notebooks with more video memory. In addition NVIDIA has unveiled new products in the mobile range. Unfortunately the naming isn’t optimal and you will soon see why – while all Kepler parts were known to be strictly 28 nm, the chip maker now has low end graphics chips that are Fermi based but use 28 nm production process technology, thus creating a possible confusion as to what exactly you are getting. To make it simple – the GTX 680M is a 28 nm Kepler chip, while the GTX 675M and 670M are both 40 nm Fermi-based. Going south we get the 660M, 650M and 640M – all Kepler-based. The 640M LE now has both 28 nm Kepler cores as well as 40 nm Fermi ones, while the 635M, 630M and 620M now include 28 nm and 40 nm cores all on the Fermi architecture.